It's really scary how fast this pregnancy is going. Too fast! One minute I want this pregnancy to hurry up so I can meet my little boy and then the next I was it to go slower because this will be the last time I will be carrying a child inside of me. The last time I grow a baby inside of me. It saddens me to think that but I have decided I really do not want anymore children. It just feels like yesterday that I had that 'feeling' I was pregnant and decided to take a pregnancy test of the 100th time. That time the test came back positive. I was petrified, I was worried, I was shocked but then all that was behind me and I started feel really excited. That time it went slow but now I am nearly 23 weeks and it's going scarily too fast. I have so much to do and buy in the next 18 weeks and I really do hope I can achieve what I want to do before baby boy arrives in July. I am wanting to get everything done and sorted by the end of June. The girls bedroom is nearly sorted (bedroom tour post soon!) and I need to make a start on baby boy's room and my bedroom, aswell as the girls' play room downstairs and making more room in the living (somehow!). I will get there with the help of my lovely partner. Saying all of that, we also have the kitchen and bathroom we need to finish too. This house is never ending. Although we have so much to do before baby boy arrives, I do have a good feeling we can get it all done. I know I just need to get off my backside and move more instead of being lazy watching TV or sitting on laptop. Don't get me wrong, I do the house work and the usual things but I am getting tired some days and just feel like doing nothing all day. I know once I move I will be ok. 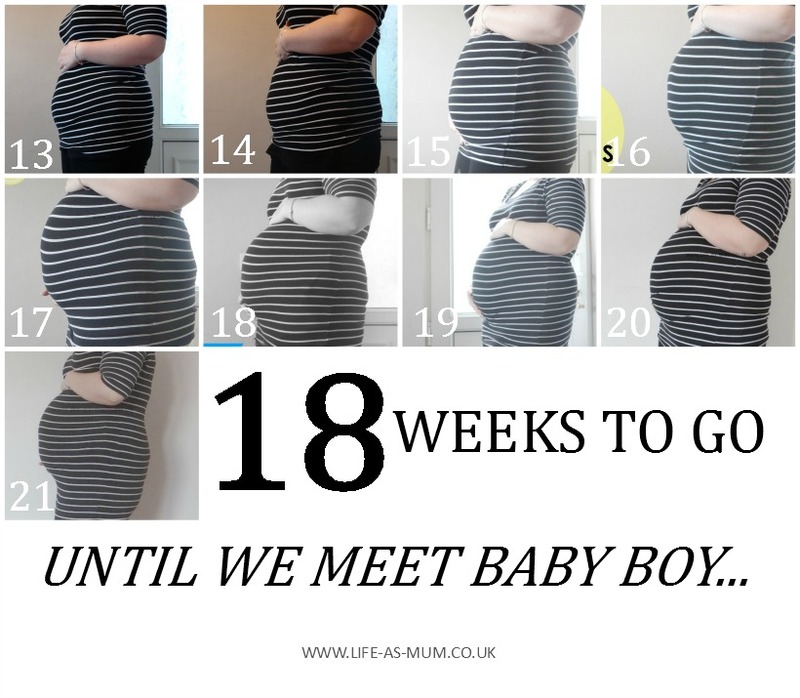 There is only 18 weeks left until Elliw changes her place from being the youngest child to the middle child. That really saddens me because Elliw has always been the baby of the family in my eyes. Maybe one of the reasons she does act a little spoilt but I do think I will find that part pretty hard but at the end of the day all 3 of my children will be and are my babies. No matter what age. I have 18 more weeks of growing, baby has 18 more weeks to develop and be ready for the big wide world and we as a family are super excited to be meeting him soon! I love seeing bum progression pics. Enjoy the next 18 weeks, they'll fly by. Your bump pics are making me miss mine. The next few months will pass so quickly. Hi Beth,you are busy growing a baby, even while you are watching television. How we grow babies inside of us is really quite amazing. I battle to grow plants (I can do cactus and beansprouts that's about it). Eighteen weeks does sound like an age, but it'll pass in a flash. I am sure you will be all ready when the time comes, it's instintive. I remember getting a desperate urge to be all sorted and ready when mine came. It's probably the only two times in my life I've been organised! Hope it continues to go smoothly for you. Its always interesting seeing how a bump changes each week. Good luck! Oh I love your weekly bump shots. I should really start I've none at 22 weeks!! How exciting, time is gonna fly by now!!!! Aw this must be so exciting. I remember my first pregnancy really dragging out but I can imagine any future ones to go quick. I think documenting it this way can make it seem really fast.